My book on FairPay was just published. It is part of a series on Service Systems and Innovations in Business and Society, curated by Jim Spohrer and Haluk Demirkan of The International Society of Service Innovation Professionals (ISSIP), and published by Business Expert Press (BEP). Anyone responsible for monetizing digital content in consumer markets should understand this radically new perspective on pricing and how to maximize customer lifetime value. 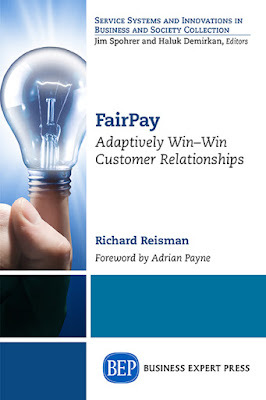 The full title is FairPay: Adaptively Win-Win Customer Relationships. It pulls together a wealth of material from the blog plus new additions. The book has sections that are very pragmatically focused on how FairPay works in specific industry use-cases (as an alternative or complement to conventional freemium subscriptions, paywalls, and other methods). It also addresses the conceptual foundations in marketing, behavioral economics, game theory, and related areas. It explains how FairPay can solve critical problems in pricing, value propositions, and customer relationships -- with a focus on the digital content and services businesses now in the throes of digital disruption, but also for other businesses. I hope readers (both early followers and those new to these strategies) will find this not only a useful introduction to FairPay, but also a thought-provoking perspective on the broader issues of modern consumer commerce and how to make it far more win-win. As noted below, there is now a LinkedIn group dedicated to building on this theme. Some of the new material in the book will be featured in added blog posts over the coming months. Details on the book and how to get it are now online. As an added feature there is a special online supplement to the book with links to updates, blog posts with added detail, and other resources (also accessible as FPZLink.com). Even before you get the book, this can offer a preview of much of the content (but in less organized form). LinkedIn Group for FairPay and related innovations -- Please join! As part of the online supplement, there is now a LinkedIn Group called FairPay: Adaptively Win-Win Customer Relationship, to enable you to connect with others who share interest in FairPay and related innovations in participative co-pricing, relationship marketing, customer journeys, and behavioral economics - especially to maximize Customer Lifetime Value for digital services. This is part of a collection curated by Jim Spohrer and Haluk Demirkan of The International Society of Service Innovation Professionals (ISSIP). ISSIP is an organization founded by IBM, Cisco, HP and several Universities with a mission to promote Service Innovation for our interconnected world. "Anyone responsible for monetizing digital content in consumer markets should understand this radically new perspective on pricing and how to maximize customer lifetime value. FairPay provides strategies and operational methods for creating better relationships -- to increase loyalty, market reach, and profits." "Reisman unveils a new world of possibilities through an innovative and visionary methodology that introduces a reference platform for digital value exchange. FairPay is very versatile in its applications and compatible across industries. It is a great example of what disruption could look like in a new digital business era." 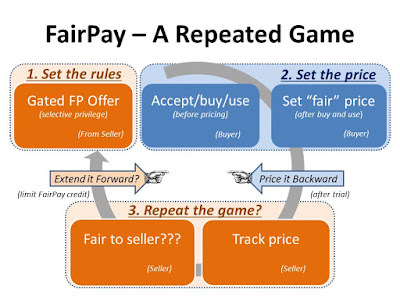 "FairPay boldly explores the future of pricing from a co-creation of value perspective. Highly recommended for digital business entrepreneurs, as well as established firms working on their digital transformation." "A groundbreaking and definitive book on pricing strategy for the digital age. This highly innovative and practical work shows how enterprises can develop relationship-based pricing strategies leading to long-term customer relationships, based on principles of equity and fairness for both customer and supplier." "This compelling book explains how a radical shift in how we set prices can help enterprises become more customer focused. It promises to transform business by providing a new operational dynamic for maximizing customer lifetime value." 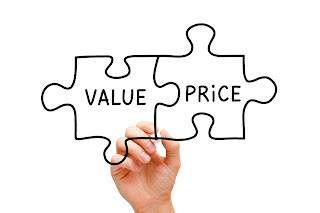 The Elements of Value, a new HBR article from Bain consultants, provides an excellent structure for measuring value in consumer markets. FairPay provides an adaptive process for managing customer journeys that center on value. These ideas can be applied in combination to drive loyalty loops around value, in order to increase Customer Lifetime Value. What consumers truly value, however, can be difficult to pin down and psychologically complicated. How can leadership teams actively manage value or devise ways to deliver more of it, whether functional (saving time, reducing cost) or emotional (reducing anxiety, providing entertainment)? 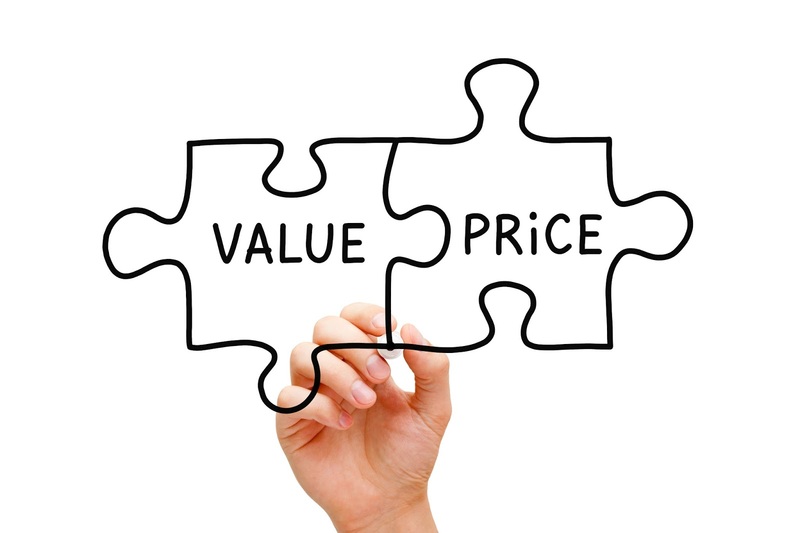 ...A rigorous model of consumer value allows a company to come up with new combinations of value that its products and services could deliver. The right combinations, our analysis shows, pay off in stronger customer loyalty, greater consumer willingness to try a particular brand, and sustained revenue growth. 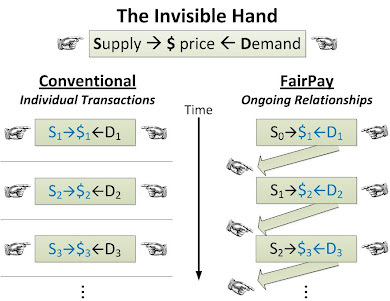 FairPay provides a structure for building relationships around value, by giving consumers limited power to set prices that correspond to the value they receive -- for as long as the seller considers them to be fair about how they do that (but not longer). This is described in my post on customer journeys and the elsewhere on my blog (see links below). The elements of value outlined in this HBR article can be an effective structure for the dialogs on value that FairPay inserts into the customer journey to enable that. Since there are 30 of these elements, in a hierarchy of four levels (functional, emotional, life changing, and social impact), it would not be practical to force dialog on every element on every cycle -- and only some of them will be relevant to any given business. But the dialog structure can be varied adaptively to introduce relevant elements whenever the customer or the business find them to be relevant. This can enable the dialogs to generate rich value data. And keep in mind, that these specific elements are just a way to specify and communicate value judgments that are actually very intuitive and nuanced. The beauty of FairPay is that it is driven by the consumer's intuitive sense of value. The seller can drive the dialog based on analytics such as these, to seek to understand that nuanced and intuitive perception of value through simple questions, while the buyer need only respond, and need not be concerned about the structure that is driving that. The dynamically adaptive nature of FairPay also enables the level of dialog to be varied over time, to collect this important value data without undue burden on customers. Value dialogs might be relatively frequent and detailed when a relationship starts, but only until a common understanding of value is reached. Then the dialog level can be cut back, or even dropped completely, as long as both parties are satisfied with putting the adaptation process on autopilot, but then re-engaged in more detail any time either party senses a disconnect on their shared understanding of value (for that particular customer). The article concludes with a quote from an executive that “I have a lot of people working on product features and service improvements, but I don’t have anyone really thinking about consumer value elements in a holistic manner.” FairPay's embedding of dialogs about value into the customer journey loyalty loop makes thinking about customer value elements in a holistic manner central to routine operations.